It's that time of year, you know what I'm talking about. If you’re a plant based eater, the Holiday Season can be a minefield of “issues”. Should I or shouldn't I go to so and so’s house for thanksgiving? Should I bring food or let them know that I have special dietary preferences? Each person will work this out over time. We’ve reached a place in our house where we want to create a Thanksgiving dinner that supports our plant based lifestyle and allows others to experience what a non-traditional holiday can look and taste like. It's not that we won't go to Holiday parties but we feel that this is the perfect time to share and invite others to share in our beliefs. For me, Thanksgiving has always been about the side dishes. Candied yams, Brussels Sprouts, Mashed Potatoes and Gravy and of course Stuffing. The great thing is it’s easy to make all of these Vegan. At our house, the side are Thanksgiving, not to mention pie! We are going to do a series of recipes to prepare for the Holiday season. Check your inbox for the latest delights. 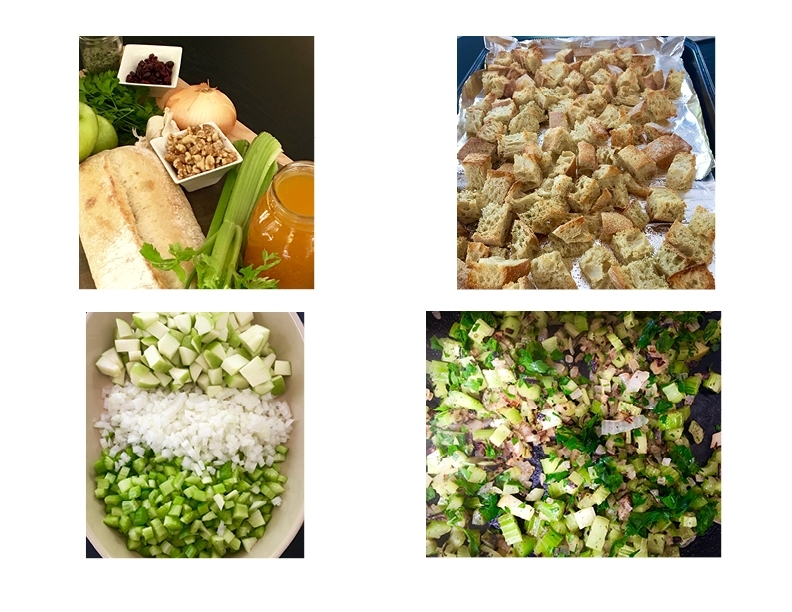 This week we visit Stuffing. If it were up to our son Carson, we would have Stuffing weekly. This recipe is delicious and easy to prepare. You can prepare it up to 2 days in advance or whip it up the same day. Place the diced sourdough bread on a baking sheet, season the bread with the granulated Garlic and dried Dill. Cook until light brown. Remove from the oven and set aside. Heat a large sauce pan over medium high heat. Add 2 Tablespoons of Broth, water or oil to the pan, add the diced onion, celery, garlic and salt. Cook until a light brown. Once light brown add the parsley continue to cook for 3-5 minutes over medium heat. Remove from the pan and set aside in a large mixing bowl, in the same pan add the diced apple cooking and stirring until light brown. Add walnuts, cranberries and Sage, cook for another 2-3 minutes then add to the onion mixture and stir to combine. Place half the bread in a bowl with half of the onion/apple mixture and 1 cup of the vegetable broth. Stir to combine, place in the oven proof baking dish. Repeat with the reaming ingredients. Cover with foil and bake for 20 minutes. Remove the foil and bake for 10 minutes, pour another cup vegetable broth over the stuffing and cook for an additional 10 minutes. This step is important in creating a crisp top and moist tender interior. Speaking of oil, it can change the flavor & overall complexity of the dish. We know that oil is not part of everyones diet, but if you want to add some to the dish the best palce to add it is in three places, first toss the diced bread with olive oil then toast. The second is in step 2 replace the broth with olive oil. The third is when you remove the foil in step 4, drizzle a genourse amount of olive oil over the top of the stuffing. This is going to create a crsip crust.